The Book presents for the first time a comprehensive study of the role of Mahatma Gandhi's ideas in the social and political mobilization of the Adivasis of the princely states of southern Rajputana during 1921 and 1948. It covers their transformation from violative culture to votaries of non-violence under the directions of Gandhi's associates, A.V. Thakkar and Shrimati Rameshwari Nehru and their followers, Motilal Tejawat, manikyalal Verma Pandit Bhogilal Pandya and several constructive workers through the networks of Ashrams and Prajamandals. The Gandhian impact was mirrored in their opting for temperence and spinning wheel as a way of life. As protagonist of non-violence, they associated themselves with the Non-Cooperation Movement (1921-22), Quit India Movement (1942) and also with Prajamandals' struggle for the establishment of responsible government (1948) in the States. The social and political awakening among them was further registered in their launching overtly and independently the campaign against the jagirdari system. The integration of the Adivasis in the mainstream of national lie was displayed in their participation in the First General Election of the Rajasthan State Legislative Assembly and in their rejoicing the establishment of a democratic government in Rajasthan State under Indian Republic. The author has evinced dedication and through research in exploring the impact of Gandihan ideas on the Adivasis on the basis of Mahatma Gandhi's speeches and correspondence, archival and Ashram records, private and Prajamandals papers, newspapers and folk songs. This book reveals a historian's perception of the impact of Gandhis on Adivasis. It would prove a refrence media to those interested in the study of social and political change among the adivasis under the spell of Gandhi. 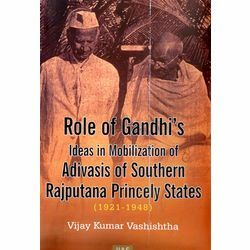 The Book presents for the first time a comprehensive study of the role of Mahatma Gandhi's ideas in the social and political mobilization of the Adivasis of the princely states of southern Rajputana during 1921 and 1948. It covers their transformation from violative culture to votaries of non-violence under the directions of Gandhi's associates, A.V. Thakkar and Shrimati Rameshwari Nehru and their followers, Motilal Tejawat, manikyalal Verma Pandit Bhogilal Pandya and several constructive workers through the networks of Ashrams and Prajamandals. The Gandhian impact was mirrored in their opting for temperence and spinning wheel as a way of life. As protagonist of non-violence, they associated themselves with the Non-Cooperation Movement (1921-22), Quit India Movement (1942) and also with Prajamandals' struggle for the establishment of responsible government (1948) in the States. The social and political awakening among them was further registered in their launching overtly and independently the campaign against the jagirdari system. The integration of the Adivasis in the mainstream of national lie was displayed in their participation in the First General Election of the Rajasthan State Legislative Assembly and in their rejoicing the establishment of a democratic government in Rajasthan State under Indian Republic. The author has evinced dedication and through research in exploring the impact of Gandihan ideas on the Adivasis on the basis of Mahatma Gandhi's speeches and correspondence, archival and Ashram records, private and Prajamandals papers, newspapers and folk songs. This book reveals a historian's perception of the impact of Gandhis on Adivasis. It would prove a refrence media to those interested in the study of social and political change among the adivasis under the spell of Gandhi.